Chalice Children (ages 3-6) and U.U. Kids (ages 7-12): Both classes will attend the beginning of the service. After the Stone Soup story, the children will head over to the R.E. Building to decorate cookies for the Annual Stone Soup Potluck! 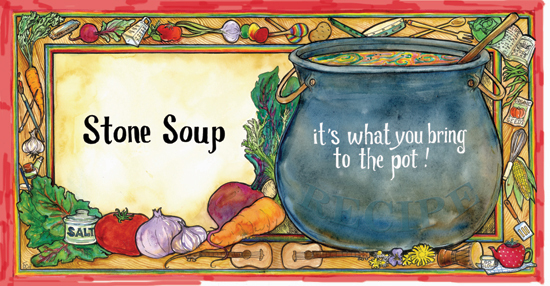 YUUth (ages 13-17): No class – The youth are invited to attend the entire Stone Soup Intergenerational Service. Please bring veggies, pasta/grains, and/or bits of meats/poultry for the soups, breads or crackers, desserts, or beverages to share as part of the Annual Stone Soup Potluck. You can sign up at: Perfect Potluck.